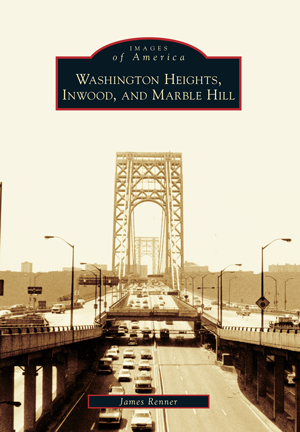 The history of Washington Heights, Inwood, and Marble Hill is interesting not only because the communities played a major role in the American Revolution but because of their cultural and educational institutions and residents whose culture and ethnicity have contributed to the well-being of the area. These communities have always been a haven for immigrants who have come here to live and work since the pre-Columbian era. Native Americans came to trade goods, Jewish refugees came during the 1930s to flee the tyranny of the Nazis, and since the end of World War II there has been an influx of the Latino community. The area is also noted for its dolomitic Inwood marble, which has been quarried for government buildings in New York City and some of the federal buildings in Washington, D.C. Through vintage images, Washington Heights, Inwood, and Marble Hill illustrates the transformation of this area over the decades. New York City native James Renner is a licensed tour guide and appointed historian of Community District 12. Renner is a member of numerous local organizations, including the Washington Heights-Inwood Historical Society, the Harlem Heights Historical Society, the Washington Heights Neighborhood Association, and the Washington Heights Business Improvement District Management Association.